After studying our maps and brochures, we finally decided to head to the unlikely destination of Ward Charcoal Ovens Historic State Park in the middle of Nowhere, Nevada, but fairly close to Ely (pronounced EE-lee) in the east central part of the state. 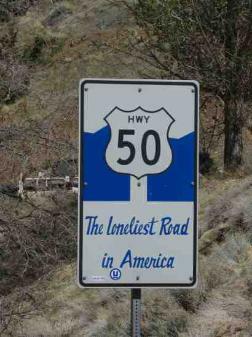 We traveled for a distance on the Loneliest Road … US-50 … a route we’d traveled in its entirety once before in our American Odyssey 2012 adventure. We didn’t feel the need to stop in Austin or Eureka, old mining towns that have seen better days, but still attract off-the-beaten-track tourists. Mine tailings scar the landscape, a telltale sign of how we’ve been treating Mother Earth. About eight miles south of Ely, we reached the gravel road that led to the park’s Willow Creek Campground, another 10 miles through parched open range and dust. The campground was a surprise. Nestled in Utah juniper and single leaf pinyon pine, the sites were spacious and private, well-maintained and outfitted with fire rings, BBQ grills and new picnic tables under cover of shady ramadas. Our recently purchased senior Nevada park passes allowed us free camping. The Ward Charcoal Ovens State Historic Park is primarily known for the six beehive charcoal ovens that dominate the park entrance. Representing ‘a unique and fascinating chapter in Nevada’s mining history’, the ovens are particularly well-preserved. The silver mining boom back in the 1870s required smelters to extract the silver. Vast quantities of charcoal, produced from the burning of the local pinyon pine and juniper, was required to fuel the smelters and hence the ovens were built. The ovens only operated from 1876-1879 when ore deposits and available timber were depleted. We wandered past, around and inside the ovens. They are, indeed, large … 30’ high x 27’ in diameter at the base … definitely large enough and far enough from civilization to accommodate itinerant folk or bandits for awhile. The ovens, which were roomy and well-insulated, sheltered stockmen, stagecoach robbers and hoboes through the years until 1968 when the land became public in a land trade with local ranchers and the state designated it as a state monument and in 1994, declared it a state historic park. Multiple well-groomed trails criss-cross the park and we took advantage of them. At an elevation range of 7,000-8,000’, days were hot, but mornings and evenings were cool. My favorite trail was called the Riparian Loop because it ran along the shores of Willow Creek. Wildflowers were everywhere … bright pink wild roses, violet-blue lupine, red cholla blossoms, yellow prickly pear flowers and yellow monkey flowers and so many more. Please indulge me, as I share these flower photos with you. Enlarge by clicking on the thumbnail. This park was so pleasant. The campsite was great. The evenings were cool and bug-free. Though there are 30 campsites, but we saw only two other occupied sites. There were plenty of interesting walks and hikes to take. Surprises were everywhere. We’d be tramping along a rocky, dusty, dry trail and then out of nowhere, a bright pink cholla in bloom would appear or a cluster of purple western asters … or a snake slithering across the path. We walked the same trails a couple of times and each time, there was something different to see. We’ve been ‘on the road’ for 50 days now. We’ve seen so much … and so little. We certainly didn’t travel as far as we’d planned. What was I thinking? Southern Arizona, California, all the Pacific Northwest and maybe across the border into Canada? All in two months? I need to get in touch with reality a bit more. It’s no different than trying to make schedules and plans on Nine of Cups. We always varied from ‘the plan’ and rarely (read that 'never') traveled at warp speed. That said, it’s been a good shakedown cruise for Blue and crew so far and we already know this life of travel and wandering is what we want to do. We stayed at Ward Charcoal Ovens for two more nights. It was a good place to be. We sat sipping our coffee in the early morning quiet that was only disturbed by the gentle breezes that rustled the trees and our own chat. We’re busy making to-do lists already for our return to Las Vegas ... and planning our next trip. Sometimes, I make wishes … not big ones … not like a winning the lottery kind of wish … just little, realistic ones. For instance, I really want to see a certain butterfly and voilá it appears, or today’s wish, I want to photograph a black-tailed desert jack. We’d seen the tail-end of several jacks on our hikes, but none stayed still long enough for even a blurry photograph. So, we were both rather surprised when, after sharing my wish with David this morning, a rather large jack wandered over, stopped and posed for several minutes about 10’ feet away while we were sitting in camp. I’m considering asking for just a little larger wishes in the future and see how I do. Tomorrow, we head out. We’ve enjoyed two glorious days at Ward Charcoal Ovens (who would've guessed it?) and the original plan was to head south to several other Nevada state parks along our route to Las Vegas. The temps at lower altitudes have been scorching. It would be like jumping from the ovens into the frying pan! Further deliberation has changed our minds (really?) and instead we’re going to head to the higher altitudes of Great Basin National Park, only ~60 miles east. Join us at Great Basin as we search for and find the oldest living things on the planet.